Hello, beautiful! I hope this blog post finds you well! I can hardly believe that it is already February. One month closer to summer (insert happy dance). Today I want to talk about one of my favorite items, moto leggings. Seriously, I am so obsessed. I have this pair to wear whenever AND a bought a pair of moto workout leggings. Side note: for those of you doing #noshopfeb may the odds forever be in your favor. How to rock moto leggings? Put them on, add a top, & work it girl! Leggings are a wardrobe staple, moto leggings are a nice update to the basic legging. When wearing leggings I think that it's key to pay attention to your proportions. I have thick soccer thighs so when wearing leggings I generally like to wear a top that is going to cover my tush & my thighs. Not that I don't love my legs but wearing anything less than tunic length would make them look extremely huge. I didn't really notice until I got these photos from my photographer but the ribbing at the thigh is actually pretty slimming (win). This pair is from one of my favorite MA shops, Femme Boutique Boston. 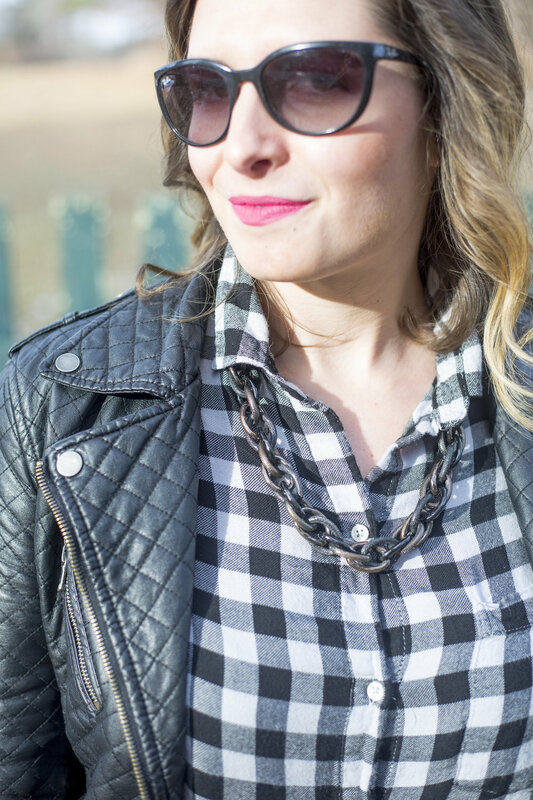 I completed this look with suede booties, my gingham flannel, & my faux leather jacket. This look is great for dinner or drinks with your friends. I have also rocked these moto leggings to work by pairing them with loafers & a cardigan. To sum up, moto leggings are a nice update to the basic leggings you already have in your wardrobe. When rocking them I would suggest being aware of the proportion you are wearing on top & make sure that it is flattering to your body type. Well fash doll thank you for reading & I hope you have enjoyed this post.